Applying different amounts of nitrogen (N) fertilizer in different parts of the field according to soil conditions seems intuitively obvious. Producers know soils differ within fields, and often those differences can result in significant yield variation. During the growing season, crops may express differences in leaf color if nitrogen or other nutrients are low in supply and deficiencies result. Crop and soil computer simulation models also suggest there can be substantial differences in soil nitrogen supply or crop nitrogen demand within a field. Yet, in practice, researchers and producers alike have found it difficult to profitably implement site-specific nitrogen management (SSNM) for most agronomic crops. This site reviews recent research in site-specific nitrogen management and recommends how irrigated corn producers in Nebraska might implement this technology on their farms. Based on research in Nebraska with irrigated corn, we suggest producers consider three options for varying nitrogen rate within fields: a predictive approach (zone-based yield potential), a reactive approach (sensor-based) and one that uses localized references within yield potential zones. A predictive approach to nitrogen management is one in which the time and amount of nitrogen application are prescribed prior to planting, accounting for soil nitrogen supply, crop nitrogen demand, fertilizer nitrogen efficiency, and fertilizer and crop prices. A site-specific predictive approach relies primarily on the use of multiple layers of spatial information to generate yield potential zones within fields. Accordingly, a field is a good candidate for site-specific nitrogen management only if it appears to have some significant variability — in texture, elevation, management or some other known factor. If a field appears to be quite uniform in nature, it is not likely a good candidate for varying nitrogen rate spatially within the field. The first step in this approach is to collect spatial data. The starting point should be at least three years of yield maps. If the field has been in a row-crop rotation, we suggest normalizing yield to allow comparison across crops. One approach to normalization is to express relative yield as a ratio of the actual yield to the field average. For example, if the actual yield for a point is 197 bushels per acre, and the field average for that year is 235 bushels per acre, the relative yield is 0.838. Having corn and soybean yield expressed in relative terms allows quantitative comparison of yield over years. Normalization of yield for a given year’s data should only occur after yield measurements collected with a combine yield monitor have been cleaned to remove outliers. 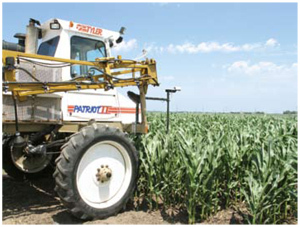 Yield-cleaning algorithms are built into some yield mapping software packages or are available as stand-alone programs. Examples of free yield-cleaning software are Yield Check (University of Nebraska–Lincoln, soilfertility.unl.edu) and Yield Editor (University of Missouri, www.ars.usda.gov/Services/docs.htm?docid=4776). Various other spatial data layers should be considered as well. The following information layers are suggested, in order of cost efficacy: soil series, aerial imagery, soil ECa and elevation. Digitized soil series boundaries (Soil Survey Spatial and Tabular Data – SSURGO), elevation (digitized elevation models – DEM), aerial imagery (Digital Ortho Quadrangles – DOQ) and other geospatial information layers are available free from a variety of online resources, such as the Nebraska Department of Natural Resources (www.dnr.ne.gov/databank/spat.html) and the Natural Resources Conservation Service (datagateway.nrcs.usda.gov/). Several recent years of aerial imagery may be available from the NRCS at little or no cost. Once several layers of spatial information are available, integrate those layers into three to five yield potential zones — areas of distinctly differing yield potential which are consistent from year to year. Currently, that is easier said than done. The simplest approach is to lay out various maps on a table, compare them side-by-side, and look for common features over space and time. Based on this visual comparison, manually draw boundaries for yield potential zones on a base map. The capability of quantitative management zone delineation may exist in various agriculturally oriented software packages, but details will vary from system to system. The following figure is one example of delineating yield potential zones. In this example, two years of relative yield (2004 corn and 2005 soybean) are combined with deep ECa (0-3 feet) and yield potential zones defined using MZA software. For this example, using two yield potential zones is most appropriate. Small inclusions of each zone within the other are relatively minor and can be ignored, as they are too small to manage practically. 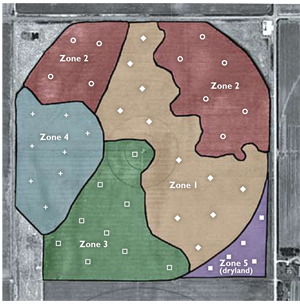 As software options are continually refined, the process of delineating yield potential zones should become easier. The producer needs to agree in principle with the zones delineated by software. There should be some reasonable explanation for why different zones exist, the number of zones and where boundaries occur. Yield potential zones may not be contiguous — that is, areas with similar yield potential may be in different areas of the field. These can and should be treated as one zone, as their properties and yield potential are the same. This process will provide soil test results which are average for the zone, at significantly less cost than grid soil sampling. If yield potential zones are not contiguous, as will often be the case, normally these should be sampled and composited as one zone to minimize sampling cost. The following figure is an illustration of soil sampling patterns for a field with five yield potential zones. In this case, Zone 2 has two patches within the field. Since soil characteristics and yield potential are the same for each of the patches of Zone 2, samples from the two patches can be combined for analysis. Set the expected yield for the middle yield potential zone as the field average. Set expected yield for higher or lower yield potential zones accordingly, but don’t differ from the field average more than about 30 percent. Use the University of Nebraska–Lincoln nitrogen rate algorithm for corn to generate nitrogen recommendations for each yield potential zone. Use the zone-specific expected yield, organic matter, and residual nitrate-N. A spreadsheet is available at soilfertility.unl.edu to calculate economically adjusted nitrogen rates for corn, using current corn and fertilizer prices. This process will result in fertilizer nitrogen recommendations which are uniform within each yield potential zone. We suggest that site-specific nitrogen management using this approach be used with preplant or sidedress application only, not fall application. If fertigation through a center pivot irrigation system is planned for the field and will apply nitrogen uniformly across the field, adjust variable nitrogen rates downward according to the planned fertigation amount. There may be situations where producers have access to more detailed information to further refine nitrogen rates within zones, rather than applying a uniform rate for each zone. The most likely situation is the use of detailed soil organic matter data. Since the University of Nebraska–Lincoln nitrogen recommendation algorithm for corn uses soil organic matter as a variable, it may make sense to use detailed soil organic matter within zones, along with zone average residual soil nitrate and expected yield. Soil organic matter can be predicted fairly accurately from high-resolution bare soil aerial photographs. In addition, there are several prototype on-the-go soil sensors for soil organic matter measurement which may be available soon. one example from a site where six yield potential zones were delineated, then fertilizer nitrogen rate was varied within zones according to the soil organic matter map. Reactive nitrogen management allows the timing and amount of fertilizer nitrogen to be regulated through diagnostic tools that assess soil or crop nitrogen status and yield potential during the growing season. Recent research has focused on the use of either passive or active vehicle-mounted sensors for real-time nitrogen management. Passive sensors rely on canopy reflectance from the sun, while active sensors use their own light source. Consequently, passive sensors must be used during daylight hours, and factors influencing canopy reflectance from the sun, such as clouds and solar angle, may influence spectral data. Active sensors are designed to cancel out solar influences, relying solely on reflectance from the internal light source, and thus can be used anytime, day or night, regardless of cloud cover. Active sensors generally are designed to emit light in both visible and near-infrared wavelengths, and use ratios of these spectra, called vegetation indices, to determine canopy chlorophyll status and thus nitrogen status, as well as biomass. Examples of commercial active crop canopy sensors are the Greenseeker (www.ntechindustries.com/) and the Crop Circle (www.hollandscientific.com/). Aerial photographs also can be used for reactive nitrogen management, especially if both natural color and near-infrared images are available. This step can be considered optional if nitrogen management will be sensor-based. Soil test information collected prior to the growing season may be useful in establishing a target nitrogen rate for the field, but is not essential. If soil samples are collected, use sampling procedures recommended in UNL Extension EC-155, Nutrient Management for Agronomic Crops. Prior to or at planting, apply a portion of the anticipated fertilizer nitrogen requirement for the crop. The primary need is to supply adequate nitrogen for the crop until the canopy nitrogen status can be accurately sensed, at about the V8 leaf stage. This amount will depend on soil residual nitrate-N and organic matter levels, but typically will be in the range of 40-70 lb nitrogen per acre. At the same time, apply nitrogen to at least two reference strips crossing the range of soils found in the field. The nitrogen rate applied to these reference strips should be high enough to ensure that nitrogen will not limit corn yield potential throughout the growing season, but not excessively high. We suggest rates of 200 lb nitrogen per acre following soybean, or 250 lb nitrogen per acre following corn, which can be adjusted if soil residual nitrate-N levels are known. For successive years of site-specific nitrogen management, rotate the location of reference strips. In-season canopy nitrogen sensing can be useful even if site-specific nitrogen management is not planned, but uniform fertigation is an option. Crop canopy sensing can still be done with sensors on a high clearance vehicle or with aerial photographs, but nitrogen application will occur later through the irrigation system. Canopy sensing should be complete no later than V16. Nitrogen application rates should be calculated in the same manner as previously described. Apply nitrogen at the rate of 20-30 lb nitrogen per acre per irrigation within two weeks after silking. The use of localized references is another option to field length, fixed nitrogen rate reference strips. Localized references, also termed calibration ramps (Oklahoma State University), are relatively small areas with differential nitrogen rates. To be most effective, these should be located after yield potential zones have been determined, using procedures described earlier. Within each yield potential zone, locate nitrogen rate blocks of 0.5, 0.75, 1.0, 1.25 and 1.5 times the field average nitrogen rate. Nitrogen should be applied preplant or at planting, in order to ensure an adequate nitrogen supply early in the growing season. Localized references can be used in several ways. If they are relatively small (perhaps 50-100 feet long), the primary use will be to calibrate nitrogen sensors within each yield potential zone. If larger nitrogen rate blocks are used — perhaps 300 feet long — they will be large enough to yield map accurately. The highest nitrogen rate can serve as a reference for crop canopy sensors in the same manner as a fixed rate, field-length strip. They also can be useful in interpreting aerial photographs. Larger localized references also can be used without sensors, by collecting data on yield response to nitrogen within separate yield potential zones. This information provides field and zone-specific nitrogen rate calibrations which will help fine-tune nitrogen management in future years. As with field-length reference strips, be sure to place localized references in different locations each year to ensure that nitrogen response is not influenced by residual effects of the prior years’ treatment. Site-specific Nitrogen Management for Irrigated Corn - EC 163.